October 9th, a surprisingly sunny day with only a hint of anything remotely autumnal, was the date Adam and Holly decided to 'tie the knot' last year. When I first met the couple, they soon confessed that neither of them were particularly confident in front of a camera. With an October wedding you can never be sure what the weather might throw at you, so we decided to head to the beach in the middle of summer for their engagement shoot to make sure they had at least one sunny shot in their collection! We chose sunset for its warmth and romance and it proved a lovely setting firstly for the two of them to practice 'relaxing' in front of the lens, and also for me to get to know this young, trendy couple with good style and good humour. It made me really look forward to seeing how their wedding day would transpire. The boys were in high spirits when I met them at a hotel in Chichester before the formalities began. Adam had two best men and another good friend who acted as Master of Ceremonies throughout, bringing a bit of personal humour to tie the day together. 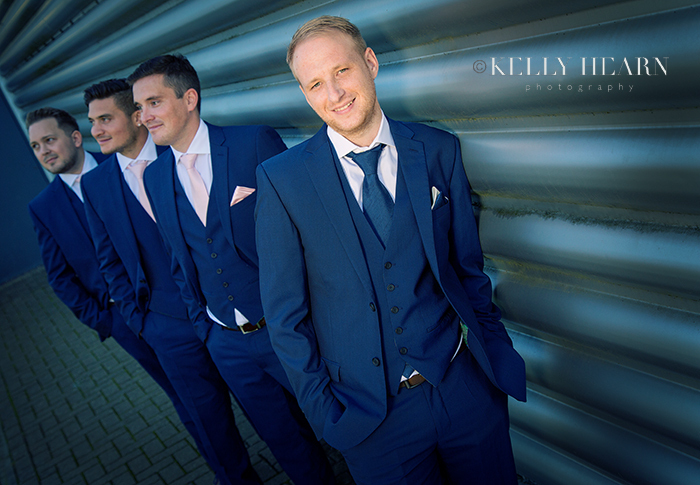 I had scouted out an industrial estate near the hotel which we took a stroll to, as the couple had wanted the groomsmen shots to have an edgier, more masculine vibe. The colour scheme for the day was a charming pale pink, accented with soft cream and gypsophilia. 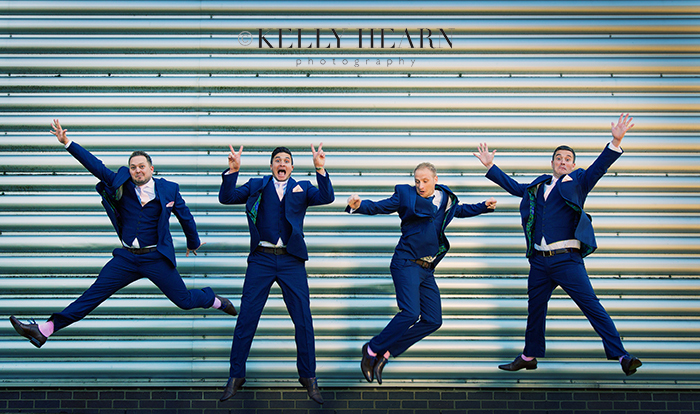 The groomsmen reflected this not only in their ties and shirts but with a bit of sneaky sock action too! Here they are chilling against the warehouse door and then cutting some serious shapes and showing off those excellent pink socks.